ANALYSIS Armed conflict, particularly the intra-state kind, is often characterised by the lack of a functioning state, and at times by a state that is actively targeting its citizens. In these settings, the provision of humanitarian aid, including health care, is a practical demonstration of human security and the protection of health care in conflict is a fundamental gauge of our own humanity, writes Rachel Irwin, postdoctoral researcher at Karolinska Institute and an associate at Futureproof Ideas. The principle of humanity dictates that aid address human suffering, protect individuals and promote dignity and respect during humanitarian crises. However, targeted violence against health care missions in armed conflict decreases the ability of health workers to carry out their fundamental tasks. Violent acts that directly affect the delivery of health care range from indiscriminate violence to direct attacks against health workers (murder, kidnapping, robbery and threats), obstruction (e.g. ambulances being stopped at checkpoints), discrimination and criminalisation (e.g. staff being pressured to treat one patient ahead of another – and even being prosecuted for not doing so) as well as damage to health facilities and vehicles. This is a global phenomenon: even in Norway, 70 per cent of ambulance personnel in the greater Oslo region have been subjected to violence, and Sweden’s Ambulance union has called for riot and protection gear for its staff. However, most international attention has been given to attacks against health workers, and against humanitarian aid work more broadly, in armed conflict and other setting of violence. 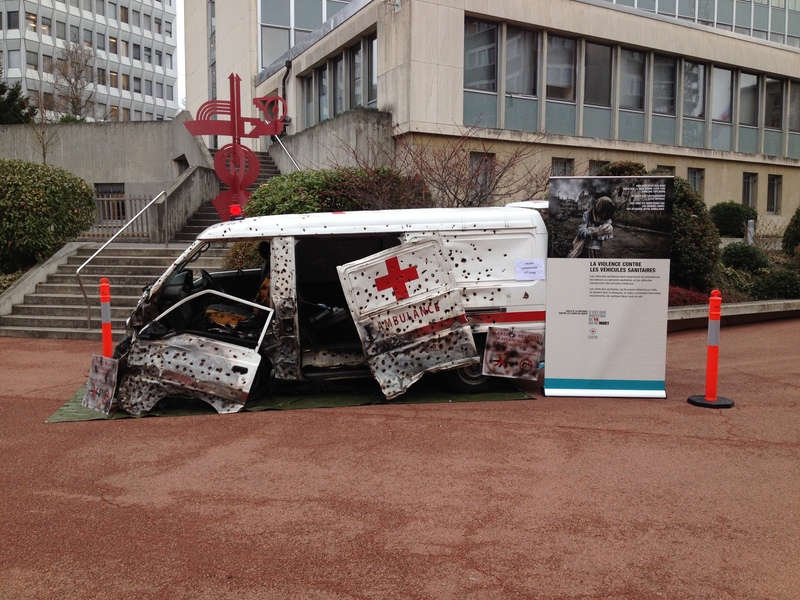 Every four years the International Committee of the Red Cross, the National Red Cross and Red Crescent Societies and the International Federation of Red Cross and Red Crescent Societies and States Parties to the Geneva Conventions meet at the International Conference of the Red Cross and Red Crescent. In December 2015 at the 32nd International Conference, where the issue featured on the agenda, delegates shared some of their daily experiences. 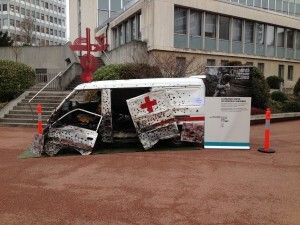 For example, a representative from Syria described how ambulance staff do not fasten their seatbelts when driving in conflict areas, so that they can evacuate the vehicle quickly – and drivers park so that passengers are able to escape and hide behind the vehicle for protection in case of an ambush. In armed conflict, the situation for health workers also includes large-scale attacks, such as airstrikes and bombings. While there is simply not enough data to definitely state that attacks are increasing globally, it is clear that certain types of attacks are increasing in some contexts within specific timescales. Currently, Syria and Yemen are two of the most insecure countries for health workers. Since the beginning of the conflict, 60 per cent of health facilities in Syria have been damaged or destroyed, many by Syrian or Russian forces. In Yemen, three Médecins Sans Frontières health facilities were bombed in airstrikes from the end of October 2015 to January 2016; the airstrikes were carried out by the Saudi-led coalition. A further example is Afghanistan, where attacks on health workers and facilities have increased by 50% over the past year. The most deadly attack globally in 2015 was that of the Médecins Sans Frontières hospital in Kunduz, which killed 42 people. On the morning of 3 October, the US-led airstrike on the facility continued for over an hour, even while Médecins Sans Frontières staff repeatedly contacted NATO and the OCHA Civil Military liaison via SMS and telephone to have the attack stopped. Under International Humanitarian Law, as put forth in the Geneva Conventions and the additional protocols, and several other agreements, healthcare is clearly protected in armed conflict. Yet, why does violence continue to occur and, in some settings, become normalised? And why do countries that are parties to the Geneva Conventions attack health facilities, as has recently occurred in Afghanistan, Syria and Yemen? The answer is complicated, and the drivers of violence range from the geopolitical to the individual. In some settings, interpersonal disputes drive violence. For example, a patient’s family may be unsatisfied with the perceived quality of treatment. In some contexts kidnappings and lootings may have a financial motive, and may be committed by armed gangs that are not necessarily combatants, but have taken advantage of the chaos caused conflict to step up their activities. In other situations, such as Syria, all sides of the conflict have targeted health facilities, including the government. Specifically, the health care system has been systematically targeted by government forces, including the persecution of health personnel who treat anyone perceived to oppose the government. Through this, government forces also aim to gain military advantage by depriving anti-Government armed groups and their perceived supporters of medical care. Finally, situations such as the hospital bombing in Kunduz point to larger geopolitical factors, and it has been suggested that governments are neglecting their commitments to International Humanitarian Law in the pursuit of the global war on terror. The multifactorial causes of violence require continued commitment at political, diplomatic, and operational levels. At the 32nd International Conference, the delegated passed the resolution Health Care in Danger: Continuing to protect the delivery of health care together, which strengthened the Movement’s commitment to tackling violence against health care. Delegates also reaffirmed their commitment to International Humanitarian Law. However, a proposal for a new compliance mechanism proposals was rejected. Instead delegates opted for a four-year inter-governmental process to find ways to enhance compliance with International Humanitarian Law, the findings of which will be presented at the next conference in four years time. The issue will also be on the agenda at the World Humanitarian Summit in May 2016 and will likely continue to be discussed in other fora, such as the United Nation General Assembly and Security Council. While this increased global attention is welcome, it does not always translate into quick action on the ground. To address violence at the operational level, agencies and individuals are continuously adapting their security measures in response to attacks. For many, the active promotion of humanitarian principles – humanity, impartiality, neutrality, and independence – is the lynchpin of security management. By working with the local community and demonstrating a commitment to treating all, regardless of religion, ethnic or political affiliations, agencies are often able to negotiate access. Beyond this, there are practical adaptations – these include changing routes when driving to avoid ambushes or requiring visitors to check their weapons outside the hospital gates. There are other examples in which agencies have switched from expensive sport utility vehicles to rusty old cars to deter thefts. Gender also plays a role: in some settings, women community health workers are seen as more trustworthy than men and have had more success in negotiating access. Finally, there architectural responses, such as coating windows with plastic adhesive to prevent shattering or building clinics with basements to withstand aerial bombardment. The humanitarian movement, in the broadest definition, exists to limit the devastating impact of conflict on communities and individuals and, in this sense, safeguard human security. The protection of health care in conflict is both a global and local responsibility, and is a fundamental gauge of our own humanity. Postdoctoral researcher at Karolinska Institute, an associate at Futureproof Ideas and a senior researcher at the Stockholm International Peace Research Institute (SIPRI). She has a PhD in social anthropology from the London School of Hygiene and Tropical Medicine.